How do I get myself into these things. It's Dance Eisteddfod season here, and my daughter simply refuses to tire of the craziness that surrounds this time of year. Truthfully I love it too, but I love the deadlines less! In the next eleven days, me and my hardworking team of Dance Mums, have to complete 32 bustles to purchased costumes to make them look more tribal, adjust 11 skirt waists for peasant girls (we'd already completely altered these AND made 23 peasant shirts from scratch! ), add pastel tulle to 16 black bustles to fluff them up and make them pretty, and embellish 16 ivory and pearl grey lace dresses with mixed fibre bodice panels, rosettes, and these multi-layered neckpiece style necklaces. 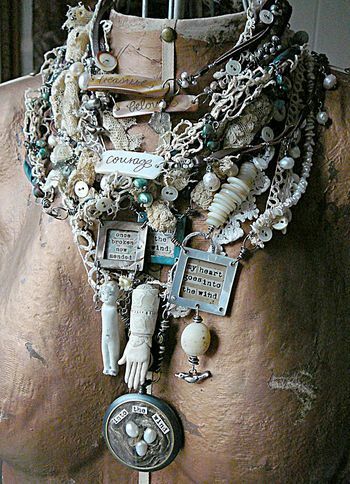 Using this bag full of beads, ornate crucifixes, pearls, shells and other varied amulets, I'm trying to create a neckpiece resembling this one below, thus saving our Dance families big money on similar accessories. Ours will not be this ornate....mostly because our dancers may struggle to not get tangled in them as they weave their elegant web across the stage. 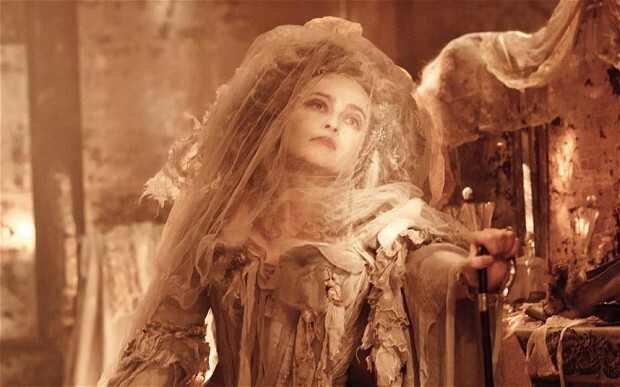 But a little of something lavish and lush will just add to their Miss Havisham look, I think. ...somewhere betwixt the two, lays the seed of an idea for our Victoriana Ghost Brides. That's about all I'm doing to save money for me or anyone else this week. Realistically, I'm saving each family at least $200 if not more. There are sixteen families. That's a saving of $3,200. I call that one good week! What did you do to save your own family or other families, big dollars this week? You are going to be busy! But is sounds like you enjoy it too! I hope all those families appreciate all your time and hard work! Thanks for sharing at Dishing It & Digging It! Looks like you have a lot on your plate, but that is wonderful that you are saving so many so many $$, I am sure they will really appreciate that! and Myself and family for Mother's Day, much less than going out, plus I would rather, eat at home anyway, way too busy on Mom's Day! quickly and beautifully with no problems. Take care hon, hope all goes well. Wow! That's some kind of savings. What a creative woman you are! I am sure it must be hectic, but what fun to be part of your daughter's dancing life! And she will NEVER forget the time and effort you put into helping her and the other dancers' families, either. My word, Mimi! It sounds like a ton of work but also loads of fun to get to play with fabric and finery. The other dance families must love you to bits! Please share pictures if you can.